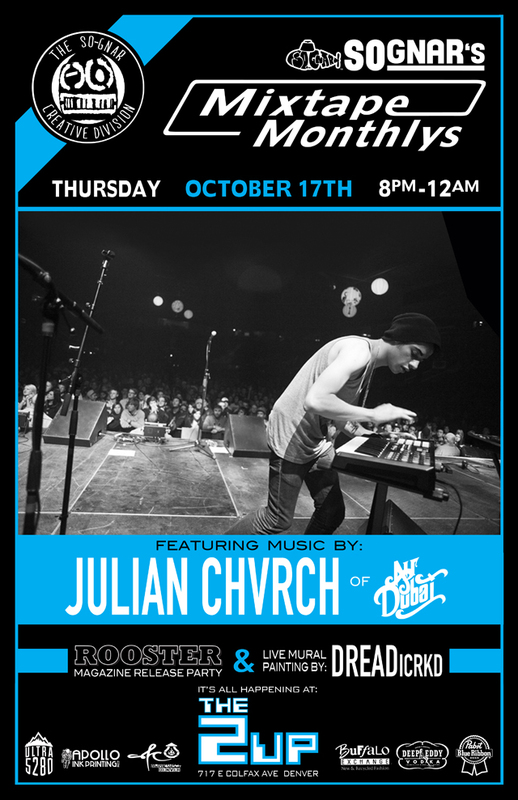 On Thursday October 17th, So-Gnar will be welcoming one of our favorite musicians from Denver, Julian Chvrch (of Air Dubai) to The 2up Video Arcade Bar for our next installment of So-Gnar’s Mixtape Monthly Release. Julian Chvrch will be performing a live set along with So-Gnar’s family of DJ’s, Producers and MC’s Captain Safety, Alex Anderson, Furbie Cakes, Typhy and Guest Dj Raw Russ of Elm & Oak. This event should be a fun evening of video gaming, So-Gnar Mixtape listening with live mural painting on the exterior of 2up. “We wanted to offer Julian a blank canvas. He has an incredible imagination and we figured offering him this opportunity to create at free will and to experiment on this release, without any limitations would be a fun project to team up on and help him grow his fan base in the action sports community,” says So-Gnar’ founder Pat Milbery. LIVE ART: We also will have live mural art 2nd installment of 7 by local Street Artist “Dread” from the ICRKD crew. painting a mural on the outside wall. DETAILS: This event is 21+ and FREE to all kicking off at 8 p.m. to 12 p.m. Drink specials will be offered from the very tasty Deep Eddy Vodka and PBR. So-Gnar will also be distributing a batch of complimentary Monthly Mixtapes and So-Gnar limited edition screenprinted posters available to those who support and attend. 2up is located on 717 Colfax Ave in the Capitol Hill Neighborhood of Denver, Colorado directly across from Argonaut Liquor Store.